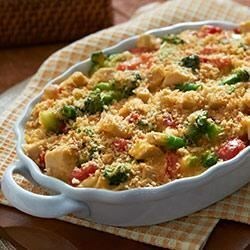 "This cheesy casserole with fresh veggies and chunks of cooked chicken bakes up golden and bubbly in about 30 minutes for a quick weeknight meal." Preheat oven to 425 degrees. Melt 2 tablespoons Country Crock(R) Spread in large nonstick skillet and saute broccoli and red bell pepper until crisp tender. Whisk milk and flour in large bowl. Add chicken, cooked vegetables, 2 cups cheese, and onion powder; toss to mix. Pour into 8-inch baking dish. Combine panko crumbs, remaining 1 tablespoon Spread and remaining 1/4 cup cheese in small cup. Sprinkle over top of casserole. Bake 30 to 35 minutes or until crumbs are golden and mixture is bubbly around edges. Excellent. Was a big hit in my house. Used a bit too much cheese, but will use proper amt next time. Fast, simple and good! I had to recheck several times to be sure the recipe said 1Tablespoon of onion powder. Way too much!! This was delicious. Was afraid of not enough flavor so I added 2 tsp of chicken bullion. Grandson who is 24 loved it. Next time I will add more broccoli, cause we love it. Loved it. Was kinda bland but just needed salt and pepper to make it complete. Yum. Exactly what I wanted on a cold, rainy night. This recipe is tasty but I must remember to keep the broccoli covered in sauce. I don't like the flavour of roasted broccoli.